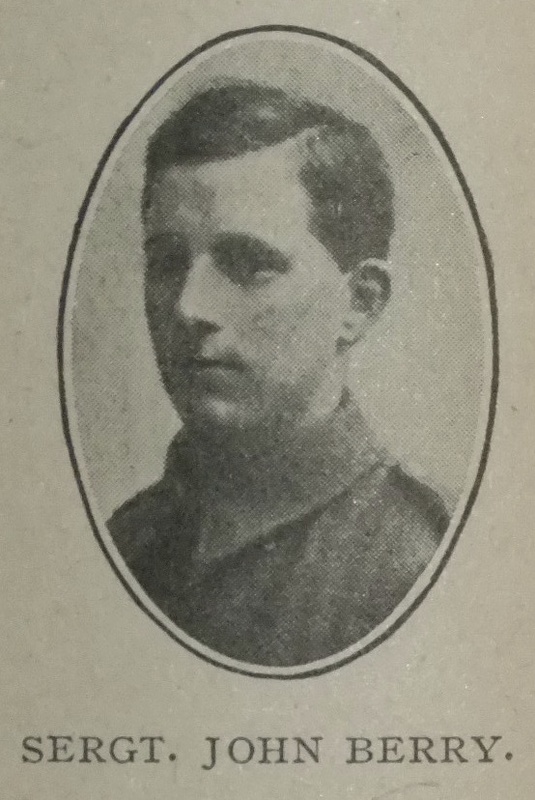 Sergeant John Berry, Cheshire Regiment, was twenty four years of age, and by strange coincidence the news of his death reached his parents, at Ingersley Clough, Bollington, on his twenty-fifth birthday, August 14th, 1917. He responded to the call of King and Country in September 1914, and was awarded the Military medal for a deed of valour at Vimy Ridge in May 1916. During a very heavy bombardment he volunteered from the trenches to carry a message for reinforcements, and through many dangers he successfully accomplished it. Whilst at home on leave, the work-people at the Bleach Works (where he had worked) presented him with a gold watch. His friends of our Bollington Church and School presented him with a silver wristlet watch and a leather wallet. Much sympathy has been extended to the bereaved parents, brothers and sisters, who are all associated with our Bollington Church. John was A/Sergeant 14544 in the Cheshire Regiment, 10th Battalion. He was killed in action on 11 August 1917.